. That would seem to be rather vague advice, except that Pollan tells us that most of what we consider to be food isn't really food. Oreos, margarine, Triskets, toaster waffles, Cheerio's, Pop Tarts, Arnold's whole wheat bread, pop-up ice-cream, soda, salt n' vinegar chips. You thought those things were food. But they really aren't. They're so full of chemicals and corn syrup that they should not qualify as food. Even your meat is full of antibiotics and chemicals. Your apples were picked so long ago, too quickly and sprayed full of chemicals. An apple picked today has far less vitamin C than an apple that was grown in 1940. Our western diet, Pollan explains, is making us really unhealthy. It's making us fat and giving us cancer. He describes studies done on Aborigines who improve their health by going back to their original diets. While the human body has become accustomed to eating a wide variety of foods, it has never gotten used to eating the fake food that we consume by the truck full today. Much of what Pollan writes about the fakeness of food in the supermarket I didn't find particularly surprising. My parents got into organic gardening in the 70s. One of the women that Pollan interviews for the book, Joan Gussow, was part of my parents' circle of friends. That's for the next post. Although I know all about the virtues of chemical-free food, I kept reading. 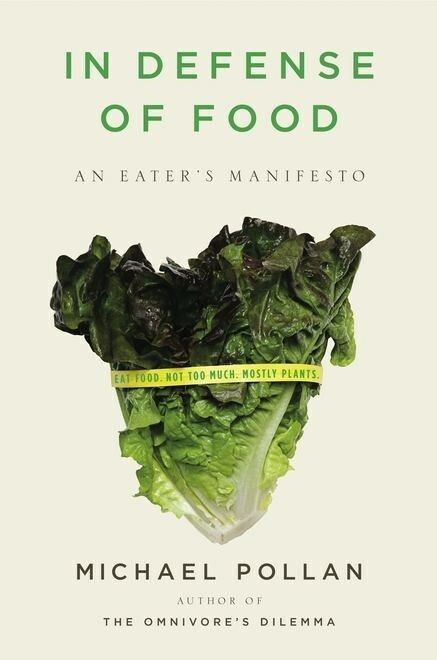 Pollan does an excellent job of buttressing the "eat food" lesson with recent research in anthropology and biology. I do like to know the facts. Most importantly, he also tells us why we we are eating crap. Big business is the first villain. It's cheaper to make crappy food, and the big business pressured government to allow it to produce crap. Nutrition scientists are villain number two. Over the past century, they have tried to figure out what particular chemical is so great in a carrot. They reproduced that chemical in a lab and pumped in into our breakfast cereal. But they can't really identify what the one healthy chemical is. The best thing, really, is to just eat a carrot. The last culprit is the decline of traditional cooking. Pollan is careful to avoid blaming women and their entry into the workforce for the declining food standards. And he is probably right. Julia Child's autobiography talks about the rejection of traditional cooking in the early 1960s. Women stopped making day-long pasta sauce long before the 1980s. Yet, the time-crunch on women today certainly does increase the difficulty level for locating real foods and then finding interesting ways of combining them. Like the nutritionists, Pollan focuses on one aspect of a healthy meal – the food – and forgets the rest. Yes, a traditional Italian meal includes everything that Pollan would categorize as food: tomatoes and basil from the garden, olive oil, garlic, onions, and red wine. But an Italian meal also includes a large extended family, five courses, five hours of eating, and at least one guilt trip. The leisurely lifestyle and the extended family have also been shown to increase overall health. While Pollan reminds me of what I should do, he fails to tell me how I'm going to find the time to do all the right things. It’s very simple. Give up on paid employment and spend at least 4 hours a day on gardening, buying produce, cooking, and washing up. I’m personally very curious about the future of backyard chicken-raising operations. 1. It’s not worth it just for eggs. 2. It’s possibly worth it for the chickens themselves, but are all these people really slaughtering and eating the chickens that their kids have named? 3. What do you do when you go on vacation? Take them to the kennel? Load them up in a crate in the back of the minivan? 4. The Egg and I. As Laura suggests, all this back-to-nature stuff is very rough on the womenfolk. My grandma was once telling me (with obvious warmth) of the day that my grandparents finally burned down their chicken coops because they were going exclusively to cattle ranching (beef cattle require mainly a few shots, some obstetrical help, hay in the winter, and water if the creek runs dry). The day the coop burned was a red letter day. 3. You sucker a friend or neighbor into looking after your chickens. My mom and her siblings were given a duckling and a chick that were named Quacky and Wacky. Grandma cooked them when they got big enough. Of course, the only reason I know about it is because my mom never forgot. Anyway, just today we made brownies from scratch, so I’m moving in the right direction. I may move on to bread. I’m a bit pissed that Whole Foods jacked-up the price of bread when wheat got expensive and kept it there. You’ll love bread-making. It is exquisite to wake up first thing in the morning to fresh bread (you can set an overnight timer if you use a bread machine). We actually were first inspired when Panera’s moved in to the old neighborhood. Unfortunately, at least in my limited experience, while white machine bread is divine, I was never very happy with how the whole wheat recipes turned out. It always went dry and inedible very quickly and it wasn’t all that great when fresh. Whatever evil voodoo the big bread companies engage in, they are at least able to produce an edible whole wheat load that you can make sandwiches out of and that my kids will eat. Amy, a friend tells me the secret is to add “vital wheat gluten.” Haven’t tried it yet. Try _More Bread Machine Magic_, by Rehberg and Conway. They have some good whole wheat recipes. I admit, the white bread always disappears quickly, while the whole wheat lingers. Also, there is something called “white whole wheat flour.” It’s whole wheat, but it looks white. It’s a way to trick reluctant wheat bread eaters into eating whole wheat. A friend has diverticulitis. I never want to suffer that, so whole grains are fine by me! I must admit, though, I don’t have the courage to set the bread machine to run while we’re sleeping. I was just having a look in my old Betty Crocker Best Bread Machine Cookbook (my dated notes peter out sometime in 2001). Based on my marginalia, it looks like my whole wheat efforts weren’t quite the disaster I remembered. However, quite a few of those recipes are 50/50 bread flour/whole wheat, rather than whole wheat. I have this fuzzy memory involving gluten, but I can’t find it mentioned anywhere in the book or in my notes. My husband made tortillas (25% whole wheat) for dinner tonight. He puts whole wheat in absolutely everything (up to and including birthday cakes). “Vital wheat gluten” sounds vaguely like something the Blob is made of. Still better than whole wheat in a birthday cake. I have used the Magnolia Bakery’s cookbook to get just perfect cupcakes. Probably not low fat as 24 frosted cupcakes = 1 pound of butter. I think a lot of people overestimate the amount of time it takes to prepare whole foods. It’s certainly possible to slave over a hot stove for hours, but it’s not necessary. Instead of letting pasta sauce simmer all day, you can chop up fresh tomatoes and basil and grate some parmesan while the pasta is cooking; toss ‘em together with some olive oil and you have your sauce. Cooking also can be a family social time if you want it to be; children can either be involved in cooking or you can cook while chatting with them. I think a lot of people get overwhelmed at just the thought of avoiding processed foods, when with a little planning and routinization it’s really not all that hard. And if people are short on time because they have two full-time incomes, they should have a little more money to spend on shortcuts- purchasing whole-grain breads, granola, and yogurt instead of making their own, etc. Spend a month giving it a try- and now is a great time when so much fresh produce is in season- and you might find that it’s not so onerous as you fear. And how are the meatballs going to cook in that time? That’s a different sauce (not a bad one, but not the same). I’m with Sarah — you don’t have to pick the highest-maintenance recipe in the box when you decide to prepare everything yourself. In our house the freezer is a big enabler to being able to cook things from scratch. We make triple batches of sauce and put much of it in the freezer; ditto for the giant recipe of home-made whole-wheat mac and cheese; also for homemade meatballs (getting around MH’s ‘how will the meatballs get cooked’ question); also for extra fruit for smoothies. Now I find myself wondering, does this still count as “cooking whole foods”? Question for the bread machine contingent out there: do you miss the kneading? I’m not sure bread would give me the same level of joy if I didn’t knead it myself. Home-made bread BTW is another thing I make in massive bulk and throw in the freezer. and Tom Philpott make a similar one – feeding people, every day, three times a day, is drudgery; no-one except the idle rich has time to cook every day. It’s not just 3 times a day either, especially if little people (who may need to be refueled every two hours) are involved. If you’re an at-home parent, dinner might be the fifth or sixth meal that you put together that day and the hours from 4 PM to dinner time are famously horrible. No wonder dinner fatigue is an issue. Pollan’s lucky we don’t just serve drive-thru milkshakes to everybody for dinner and call it a day. I don’t find meatballs very burdensome. You can bake them for 15 minutes in the oven which is infinitely less trouble than sauteeing. And pan-frying some chicken thighs doesn’t take any longer than putting chicken nuggets in the oven. We don’t by any means have a perfect diet in our two-career home (we’re definitely guilty of too many salty snacks and overrelying on sliced cucumbers as a vegetable), but we don’t eat TV dinners, either. That said, I love Triscuits. Have you all read Perfection Salad, about the rise of nutrition science as a female domain in the late nineteenth century? It is fascinating on the subject of how traditional home cooking became demonized in favor of blander, whiter, more scientific foodstuffs, and how measurement overtook pleasure. We’re seeing the opposite now, of course, with commercial foods that are directed at maximum salt and sugar, but in both cases the idea that science can solve all your family feeding problems causes all kinds of interesting trouble. What? The meatballs cook in the sauce (after browning, which I suppose you could do under the broiler). Ah, leftovers? And planning one’s shopping? From time to time, I see reports on studies of American’s food habits in the press. What stuck in my mind was, Americans want to prepare something which uses, at best, one pot. Another finding was, many prepared foods didn’t shorten the time spent cooking, which tended to hover at 30 minutes; it made more elaborate (read, high in calories) food possible. I started baking more bread, and cooking more meals at home than the norm, due to food allergies in the family. Once I started reading food labels on a constant basis, I found more reasons to cook. I recommend Martha Stewart’s _Great Food Fast_. That’s just silly. As in every other point in history, just about everyone other than the comparatively rich has no choice but to do so. My husband and I both work and we still eat real food, and we can’t afford to hire someone else to cook it so we do it ourselves. With planning and careful choices, it doesn’t take much time. I have a pressure cooker; tonight I’ll throw some lentils and brown rice and herbs into it which will cook in 15 minutes. While it’s cooking I’ll cut up some vegetables for a salad and shake up some oil and vinegar for a dressing. Done. Yes, and then you dump them in the sauce. Sorry if I was unclear. Unless you just like plain meatballs–I make some Chinese-y ones with five spice that stand on their own.